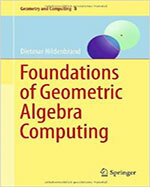 The author defines “Geometric Algebra Computing” as the geometrically intuitive development of algorithms using geometric algebra, with a focus on their efficient implementation.The goal of this book is to lay the foundation for the widespread use of geometric algebra as a powerful, intuitive mathematical language for engineering applications in academia and industry. The related technology is driven by the invention of conformal geometric algebra as a 5D extension of the 4D projective geometric algebra, and the recent progress in parallel processing. This book is organized into three parts: in Part I the author focuses on the mathematical foundations and the usage of Maple for symbolic geometric algebra computing; in Part II he explains the interactive handling of geometric algebra; and in Part III he deals with computing technology for high-performance implementations based on geometric algebra as a domain-specific language in standard programming languages such as C++ and OpenCL. This book is suitable for students, engineers, and researchers in computer science, computational engineering, and mathematics.